Traditionally, people have attended church on Sunday mornings. Palo Altans, however, shop at the California Street farmer’s market (which can also be a spiritual experience). Purple cabbage. I’ll make sauerkraut with this, a bit of shredded carrot and a bit of shredded radish. I love the color of sauerkraut made with purple cabbage—a deep magenta. My kraut-filled glass jars glimmer like precious jewels lined up on my shelf (and they are precious!). Watch this Sandor Katz video to learn how to make sauerkraut (it’s incredibly easy). Carrots. I eat these raw, steam them, throw them in kraut and use them for mirepoix. Radishes. I snack on these and add them to sauerkraut. Cauliflower. I was never much of a cauliflower fan until I tried this dish of roasted cauliflower with olives and rosemary. I make it about once a week. Even my picky daughter Charlotte eats it. Celery. Charlotte will almost always eat a snack of celery with peanut butter (I bring a glass jar to Whole Foods and fill it with freshly ground peanut butter in the bulk section), so I need this on hand. I also use it for mirepoix. Apples. Only one or two vendors still have them. Cilantro. I’ll make dal for dinner tonight and needed this for garnish. I also cook lots of beans (I’ll soak black beans tonight) and garnish them with cilantro. Tomatoes. These are hydroponically grown, so I feel like I’m cheating (they’re not actually in season yet), but I needed them for dal. Raw milk! I almost forgot to add raw milk to this list. The vendor—Schoch Family Farmstead—set up shop at the market today for the first time. The small dairy also sells raw cheese (!). I tried some samples, which were fantastic. But, like practically all cheese, it was packaged in plastic-coated paper. Cheese is very difficult to find plastic-free, let alone garbage-free. 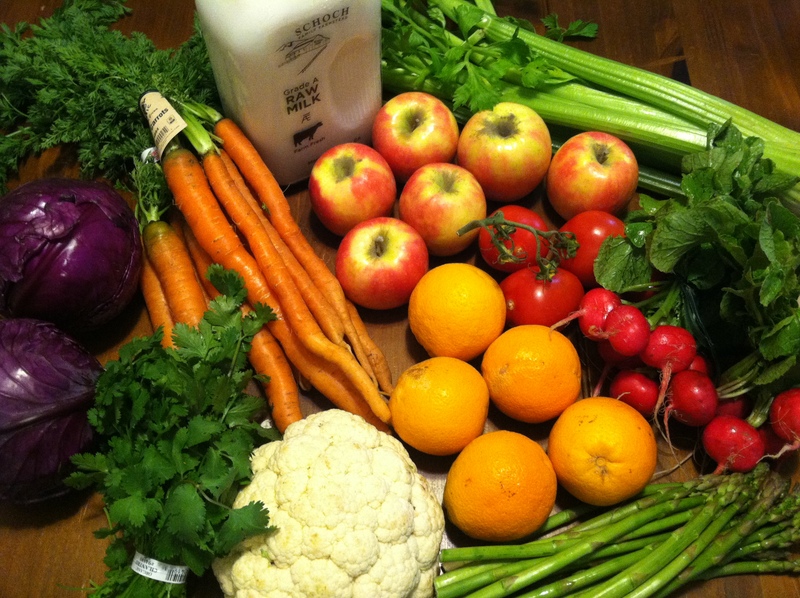 Local, organic produce consumes less oil and gas in its production and transport. You support local farmers and small businesses. More of your cash supports your community—according to IndieBound, for every $100 you spend locally, $68 stays in your community, versus $43 when you shop at a national chain. You eat healthier produce because it’s seasonal. I’m pretty sure you’ll enjoy the atmosphere more than that of a Walmart grocery aisle. You can search for a local market in the U.S. here. I just tested the link and seven markets popped up in my area! Maybe I can shop midweek!